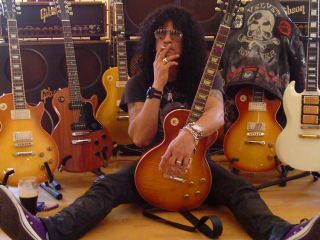 According to US entertainment website Hollywood Reporter, Gibson is to release eight Slash-branded guitars in March 2008. Details of whether they will all be Les Pauls have not been confirmed, but Henry Juszkiewicz, chairman and CEO of Gibson Guitar, confirmed the company's plan. There will be eight to cover all ends of the market. Juszkiewicz explains. "They're going to go from cheap to high-end custom, personally signed by Slash." The Slash series will appear in stores 15 March 15, and Juszkiewicz revealed there would be a big stunt around the street date. Gibson recently created a big media stir with their Robot Guitar. The Les Paul guitar with robotic self-tuning technology received a Best Of Show award at the Consumer Electronics Show in January 2008 and despite costing $2500, sold out in two days. Also in the pipeline for Gibson in 2008 is a more affordable version of the Robot Guitar and another Jimmy Page signature model. "The ink is still drying on the deal," Juszkiewicz tells Hollywood Reporter. "It's going to be a special guitar."